For textile students, tailors or fashion designers, our Dressmakers Tape is an essential tool. Still based on a classic design, it allows you to clearly and accurately take measurements of both people and fabric. Creating a perfectly structured garment requires precision and the perfect cut. This is where our tape comes in handy. It has been manufactured from a flexible and hard wearing fiberglass. The pliable design allows it to be wrapped around waists or twisted around corners depending on your individual requirements. On one side, the ruler is coloured a bright and vibrant yellow. On the other, a plain white has been used. In choosing a double-sided design, we ensure you are able to take accurate measurements, regardless of the colour of fabric you are using. Clear black line and number markers have been printed along both sides, allowing the user to measure up to 15cm in mm increments. Short metal ends provide additional durability and prevent the fabric from snapping or tearing after repeated use. When not in use, the flexible measuring tool can be folded up into a compact design and slipped into back pockets, sewing kits or pencil cases. As experts in our field, we understand the need for bulk orders when it comes to essential measuring tools. 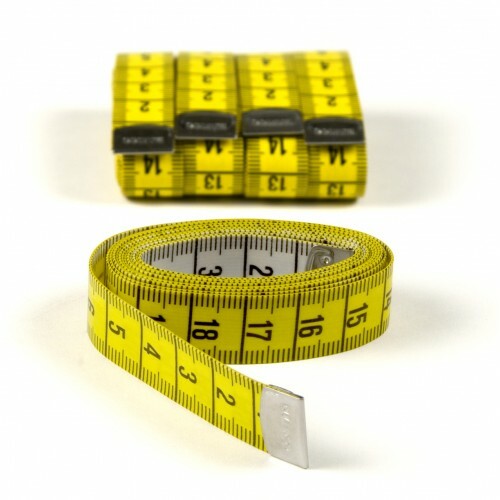 For orders over 10, each measuring tape will incur an individual price of just £0.84. For orders over 100 pieces, each tape will incur an individual price of just £0.72 - helping you to stay within your budget at all times.